West Milton Cider Club - West Milton Cider Co.
Our local club was formed in 2000 when I had to pick up apples from an orchard being grazed by Dawn’s horses. Having collected them and knowing they were cider apples I asked around the village if anyone fancied having a go at making cider. 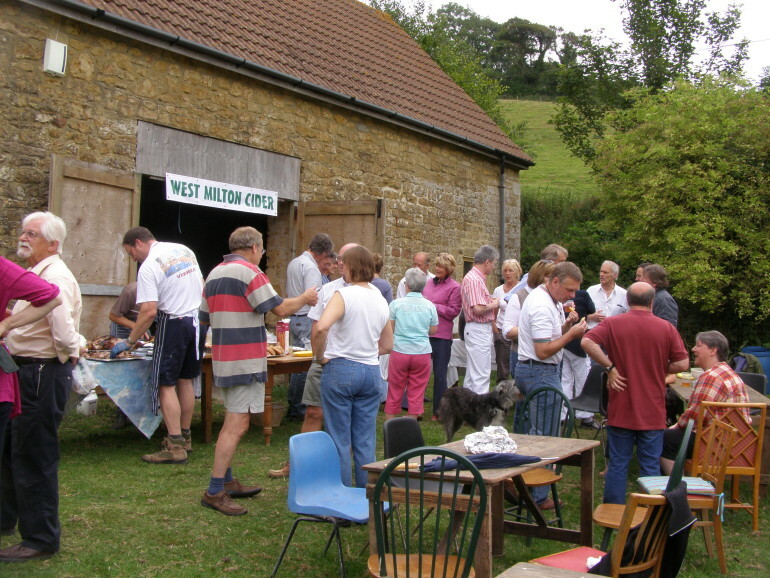 Low and behold 20 neighbours signed up with £20.00 donations and the West Milton Cider Club was born. Until 2014 we were lucky enough to have the use of an old stone barn in the village – the perfect place for cider making, storing and drinking. However this year we are to move to new premises as the owner of the old barn intends to convert it to accommodation and will no longer have room for us. Initially we panicked as no other facility was readily available but thanks to the huge generosity of Margaret Morgan-Grenville of Milton Mill, we are now due to move into a new purpose built barn this summer. It is situated in the perfect spot beside the old mill leat and on the edge of her main orchard. From now on we will be able to gather fruit from the trees, make the cider and drink it all in one place, excellent. Also wassailing will be a lot easier with the comfort of a barn in the orchard to provide shelter when it rains – as it usually does when we decide to hold a wassail! A lot of our cider from the club goes to fund raising events and over the years has helped raise a lot of money for local charities. The idea of the Powerstock Cider Festival started following a successful tasting evening at the shed after our first ever pressing season – the festival is now in it’s fourteenth year and still going strong.